This Gildan round-neck T-shirt shows on the front what poison ivy ALWAYS looks like and on the back what poison ivy NEVER looks like, with a sometimes section as well. This is a great, fun, attractive way to learn and teach poison ivy identification. 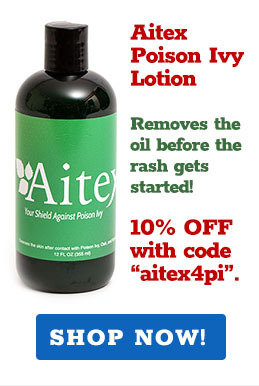 Save your family, friends, and staff, and even yourself from the horrors of skin rashes. Shirt is Gildan natural off-white color. Available in sizes from Small to XXL. Send a photo of you in the shirt so we can replace MY dorky photo!